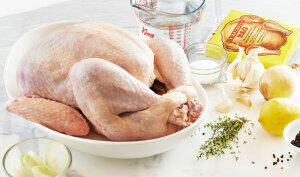 Brining adds flavour and moisture to your turkey meat. The brining process, soaking a whole turkey in water saturated with salt, is believed by many to be a favourable way to prepare turkey. The brining process requires a 6-24 hour soaking period, and ideally should be done the day before roasting. The length of the soaking period will depend on the turkey, water and your own personal experience and tastes, so experiment a few times to see what works best for you. 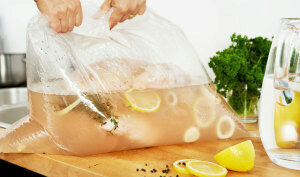 You will need a brining bag, available in many kitchen supply stores, which is designed especially to brine poultry. Or if not available, you will need a large enough container (food-safe plastic container or non-corrosive covered pot) to hold the turkey while submerged in brine. There needs to be sufficient room to fit it in your refrigerator. Remember, the addition of the salt in the brining procedure will yield a salty flavour to the turkey so it is wise to omit salt as an ingredient in the turkey stock. In a brining bag or clean non-corrosive covered container, large enough to hold the turkey, dissolve the salt and sugar in a small quantity of hot water. Allow the water to cool before adding to the balance of the water required for brining. If desired, add herbs and spices to the soaking solution. Submerge the turkey in the solution. If the turkey is not fully submerged, mix additional brining solution in the ratios indicated above until there’s enough liquid to cover the entire turkey. Seal bag or cover the container, and set the turkey in the refrigerator for 6-24 hours. Remove the turkey from brine. Thoroughly rinse under a slow stream of cool water, rubbing gently to release salt, both inside and out. It is important to ensure that the turkey is rinsed extensively. Pat the skin and both cavities dry. In the larger cavity of the turkey, place any combination of vegetables and spices, or stuff the turkey as you normally would. Brush the turkey with melted unsalted butter, turkey broth or other liquid as desired. 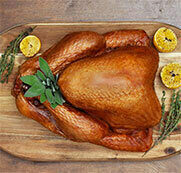 Place the turkey on a V-rack or sturdy wire rack in your roasting pan. Roast the turkey in a preheated 350°F (177°C), basting as desired until the internal temperature reaches 170°F (77°C) in the thigh for an unstuffed turkey and 180°F (82°C) for a stuffed turkey. If stuffed, any stuffing placed in the cavity of the turkey should reach an internal temperature of at least 165°F (74°C). Remove the turkey and let stand for 20 minutes before carving.